“Christianity seems like just another screwed-up religion!” Anna said. “Seriously, what has Christianity done for us—or for the world, for that matter? They’re just a bunch of hypocrites, that’s what I think! Are they good for anything?” “I don’t know, Anna,” Caleb said. “I just don’t know.” Caleb has been a Christian for a long time. But he realizes that he can’t bring himself to share his faith with anyone because it doesn’t sound like good news anymore. Christianity’s truth claims come across as hollow, arrogant and intolerant. Christians have a bad track record of hating and condemning those they disagree with. Worst of all, it feels like Christianity is just about “saving souls,” giving people an escape ticket to heaven while the world falls apart. Is it only about Jesus forgiving our sins? 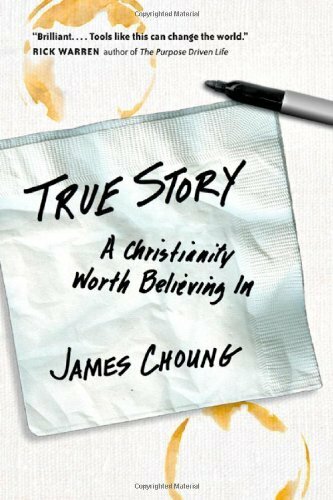 There must be more to it than that… In this engaging narrative, James Choung weaves the tale of a search for a Christianity worth believing in. Disillusioned believer Caleb and hostile skeptic Anna wrestle with the plausibility of the Christian story in a world of pain and suffering. They ask each other tough questions about what Jesus really came to do and what Christianity is supposed to be about. Along the way, they discover that real Christianity is far bigger than anything they ever heard about in church. And the conversion that comes is not one that either of them expects. Join Caleb and Anna on their spiritual journeys as they probe Christianity from inside and out. Get past the old clichés and simplistic formulas. And discover a new way of understanding and presenting the Christian faith that really matters in a broken world.